Catalan-style cannelloni is a typical dish in Barcelona. 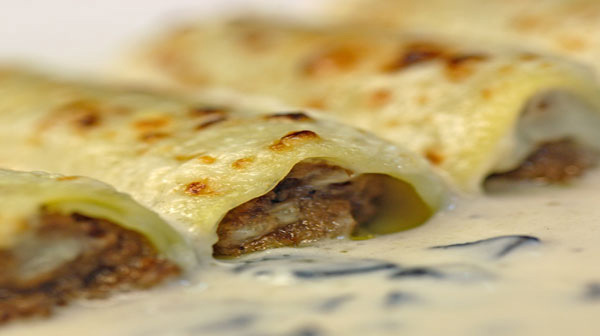 It is made by filling rectangular sheets of pasta with meat, fish or vegetables, rolling them up, covering them with béchamel sauce and gratinating them with cheese. Canelons are eaten all year round but the most typical occasion is Boxing Day, taking advantage of the roast meat left over from Christmas lunch. This is the basic difference between Catalan and Italian cannelloni: here they are stuffed with roast meat, while there minced meat, mixed with a sofregit of tomatoes, is added directly. Cannelloni are a relatively recent addition to Catalan cuisine. They were introduced by the Italian chefs of the Barcelona bourgeoisie at the end of the 19th century and, from then on, they began to become very popular across the country and appear in cookery books. Boil the cannelloni sheets in a saucepan of water with a little salt and oil. Cool them, spread them out on a cloth and dry them. Salt and pepper the meat, then roast it with the cinnamon, garlic, onion and tomato. When it is half done, make the wine reduction. Strain off the juice, remove the cinnamon stick and put everything in the meat mincer. Mix this with the béchamel sauce and spread it over the cannelloni. Roll up the cannelloni, put them in a baking tray coated with butter. Add the tomato sauce to the béchamel sauce and cover the cannelloni. Put the grated cheese and some knobs of butter on top. Put them in the oven for 15 to 20 minutes to heat them up and brown the cheese.